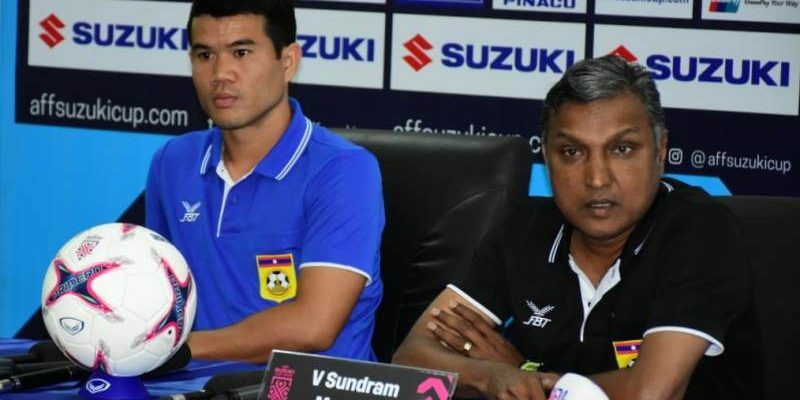 VIENTIANE (7 Nov 2018) – It will be the biggest match yet for newly-appointed Laos head coach V. Sundramoorthy but the former midfield maestro is keeping his cards close to his chest. Not willing to let slip any inkling of how he will approach the game tomorrow when Laos open their AFF Suzuki Cup 2019 campaign against Vietnam, all that Sundramoorthy was willing to say was that they are preparing ‘something’ to face their higher rated opponents. “It will be a big challenge to play against Vietnam for sure,” said Sundramoorthy. Sundramoorthy took over the Laos squad just three weeks ago and while the team fell to Mongolia in a friendly, still it has not deterred the former Singapore head coach from whipping his players into shape. The team has been in training secretly over the last two weeks where all sessions were held behind closed doors. Sundramoorthy said that it was important to control the information about the team. “While we look for advantage playing at home, it was also important that we do not leak out any information about the team, about the players or how we will play this match against Vietnam,” he added.